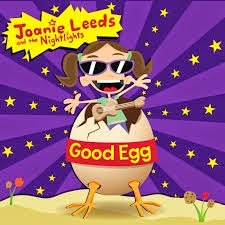 Have you heard of the Album called Good Egg by Joanie Leeds & The Nightlights well let me tell you are in for a treat. This album is release on June 24th be on the look out for that but to me her sound is country pop very upbeat and anyone can dance to it. The kids love the music. The one song that sticks out right now is called with my dad it is a song talking about how they are never sad with their Dad and how many great thing they do with their fathers and how happy they are. How perfect is that?? Father's Day is tomorrow and this is such a great song. Good Egg dances with delight through a roll call of musical genres. Joanie Leeds says I have never been one to stay stuck in any one particular musical style because I know kid's love them all rock, pop, funk, soul, ska, go-go, gospel, country- and frankly so do I. An exceptionally versatile artist, Joanie Leeds is gifted with a soulful "rock solid" voice that ranges from low and bluesy to high, light, and breezy.